Berlioz Historical Brass serves as an administrative forum for a variety of projects and assists ensemble members (and others) with various recordings, original research, publications, and performance editions. From this role, Berlioz Historical Brass hopes to continue to encourage and foster more interest in brass instruments of the early-to-mid 19th century. 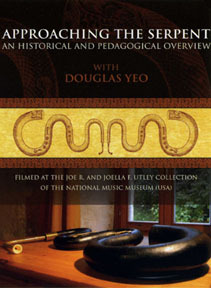 We are pleased to announce the forthcoming release of the instructional DVD, Approaching the Serpent: An Historical and Pedagogical Overview, by BHB member Douglas Yeo. For more information, go to the Approaching the Serpent website. We are pleased to announce the 2007 release of Back from Oblivion, an ophicleide recording by Nick Byrne and David Miller, piano, produced by Melba Recordings of Australia and supported by Berlioz Historical Brass. We are pleased to have supported the 2003 production of Le Monde du Serpent (“The World of the Serpent”) by BHB member Douglas Yeo. This unique recording, initiated, conceived, and produced by Mr. Yeo, features music for serpent and contrabass serpent. He is assisted by Deborah DeWolf Emery (piano), Jennifer Ashe (soprano), Gloriæ Dei Cantores, Berlioz Historical Brass, and members of the Boston Symphony Orchestra. Le Monde du Serpent (BHB 101); released October 2003; recorded in Symphony Hall, Boston and The Church of the Transfiguration, Orleans, Massachusetts, April 2002, March and May 2003.
a major goal of Berlioz Historical Brass. Our first commission, Les Mots de Berlioz by Clifford Bevan, was published by Piccolo Press in 2004. This composition is written for choir, buccin, ophicleide, serpent, and bassoon. Berlioz Historical Brass then commissioned Bevan to prepare a performance edition of Three Marches for Harmoniemusik (c.1833-34) by F. Mendelssohn for flute, clarinets, bassoon, horns, trumpets, trombone and English bass horn. In 2009 for the Mendelssohn Bicentennial year, Berlioz Historical Brass premiered Mendelssohn's Seasons for horn, trombone, English bass horn, and ophicleide by Clifford Bevan. This composition has also been scored for modern instruments: two horns, trombone, and tuba. These editions are available from Piccolo Press. Beginning in 1999, Berlioz Historical Brass initiated a harmoniemusik project with Jon Gillespie of Sarastro Press. This project now includes seven editions available for purchase directly from Sarastro Press. We have commissioned two Moravian works, first performed in the United States during the early 19th century, that include the Moravian bass horn. These editions will now available for sale after their premiere performance in 2009 at the Moravian Music Festival in Bethlehem, PA.
Kommt, ach kommit ihr Gnadenkinder Chor by Johann Christian Bechler (1784 – 1857) edited by Jon A. Gillaspie for S.A.T.B Chorus and 2 flutes, 2 clarinets, 2 horns, trombone, bass horn, violins, viola, violoncello & double bass; program notes. Heilger Schauer deiner Nahe Coro by Andreas Jakob Romberg (1767– 1821) edited by Jon A. Gillaspie for S.A.T.B Solo & Chorus and 2 flutes, 3 clarinets, 2 bassoons, 2 horns, bass horn, violins, viola, contrabass & organ; program notes. Within the realm of sacred music, Berlioz Historical Brass has commissioned one work representing the early 19th century practices of neo-Gallican chant sur le livre for choir with serpent, Messes Royales, Premier Ton by Henri DuMont, realized by Peter Wilton and published by the Gregorian Association.